I love my Mohu antenna. I have 2 right now, one on each TV in the house. I love that it picks up local channels so that when I am using my Roku I don't have to lose out on things like local news or sports. The Leaf Glide is the first of its kind. 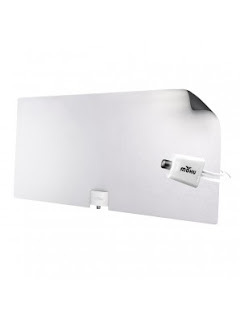 An indoor antenna with the power of an outdoor antenna. The Glide reaches up to 65 miles for a signal (most antennas are 20-25 miles). Using technology called SignaLift the Glide is able to pickup some of the lower frequency channels that other antennas may not get. The Glide is definitely the largest antenna, but it's still paper thin and reversible. The best part about the Glide is that it's plug and play! Simply plug it into the back of the TV using the cords provided, let the channel scan run, and you are soon on your way to watching great local TV. The Mohu Glide is the newest antenna in the collection, and here is what makes it special! You can purchase a Mohu Leaf Glide online here for about $89.99.